The Apple’s latest Software update is available now, which is iOS 11.3 and can be installed on Apple smartphones, iPads and iPods. 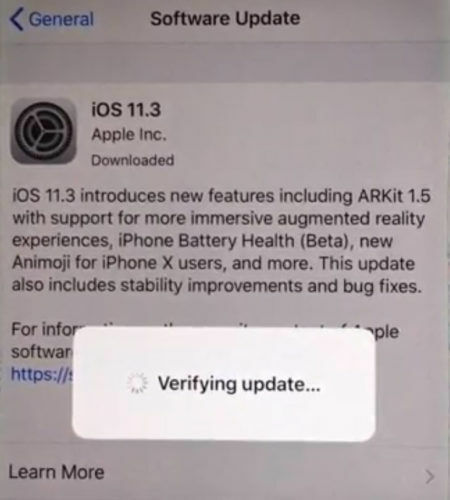 You can download the update directly from your Apple device or if you want to install the update offline, download the update for your device from below links and then install it via iTunes. In this new release, many bugs are fixed and lots of new and useful features are added for the Apple users. Let’s first quickly go through the new features included in iOS 11.3 and then we’ll share the iOS 11.3 direct download links for all Apple devices including iPhoneX, iPhone 8, iPhone 7, iPhone 6, iPhone 5, iPad Pro, iPad Mini, iPad Air, iPod Touch etc. I won’t be listing down the technical changes which were made in iOS 11.3 but the changes which are good for normal users. iOS 11.3 brings an overall improved responsiveness to the system. The menus are snappier and the animations are smoother. The biggest update in this release is the battery settings. Apple introduces the battery health stats. This will not only show the current health stats but also enable better battery life in the long run. iOS 11.3 actually take less space after installation as compared to iOS 10.3.1. This will enable you to save more personal data on the Apple device. If you are running low on storage space then this is a must upgrade for you. Apple made another fix to messages. Previously, the messages were not displayed in a sequential way. Now it has been fixed and you will get sequential messages instead of the jumbled data. Go to Settings –>General –>Software update. If an update is present, you can click on Download and Install, then your phone will start downloading the latest update and after downloading, an update will auto install on your mobile. But for downloading, your phone must stay connected to an internet connection throughout the downloading. If you are having the latest iTunes software on your System. Open it and attach it with your mobile. If you do not have iTunes software, download iTunes 12.7.4. I’m not an expert of Apple devices. So if I have got anything wrong or I have missed anything related to this update, please let me know through comments below. Thank you. To be a iOS operator I don’t have iPhone I tried to download this.